Toast the piece of bread until it’s golden brown. Use the avocado half without the pit and store the half with the pit (this will help maintain freshness). Remove the avocado from the skin, place the avocado flesh with a squeeze of the fresh lemon juice into a medium bowl, and mash it with a fork. 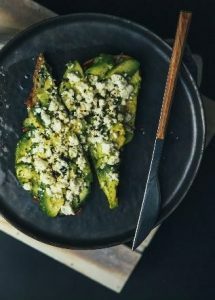 Spread the mashed avocado on top of the toast, followed by the crumbled goat cheese and chopped chives.